The Loro Piana Superyacht Regatta 2016 came to a spectacular close last week with first places not decided until the final race had finished. For the superyacht fleet, it was a full four days of racing on the Costa Smeralda. The first day saw the three classes race on a 31 nautical mile course with Saudade winning in Class A and Sub-Class C, and Grande Orazio winning in Class B. Race Day Two lead the superyacht fleet on a course that tested their sail handling skills in winds that topped out at 22 knots at times, and saw a change around of the leader board with Ohana winning Class A and Sub-Class C, but Grande Orazio remaining comfortably on top of Class B. The third day of the regatta unfolded in light breezes and saw yet another yacht come out triumphant, as WinWin topped the scoreboard, Saudade led the Sub-Class C pack and Whisper won in Class B. Race Day Four offered a shorter course for the fleet, in the gentle breeze of six to nine knots and it was Seawave that earned first place in Class A. Meagan finished the regatta on a high with a win in Class B, and Ohana topped the Sub-Class C points board. The Wally fleet managed to pack in a total of five races into three days. Race Day One took the Wally yachts on a coastal course that resulted in a win for Magic Carpet 3. The race committee tried to give the Wallys a windward-leeward course for Race Day Two but the race was cancelled due to no wind. Racing picked up on Race Day Three, when the Wally fleet raced both a coastal and windward-leeward course, with Magic Carpet 3 and Open Season winning respectively. The final day saw a head-to-head between Open Season and Magic Carpet 3, who did battle on two windward-leeward courses, the first of which was won by Lyra and the second by Open Season. 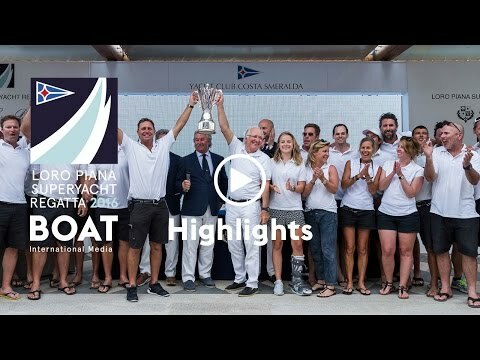 The end of the four-day regatta saw a triumphant win for two owners, both of whom achieved personal goals by winning again in the waters of Porto Cervo. When Saudade was named winner of Class A and Sub-Class C, her owner revealed it was a dream of his to win again — following last year’s success. He did so in style, taking four trophies home with him after earning the IMA trophy for overall top scored classified yacht that is an IMA Member, the Loro Piana Prize for first place for Class A and Sub-Class C and The Loro Piana Prize, The Silver Jubilee Cup by Boat International Media. In the Wally fleet, it was Open Season that came top of the leader board. “Sometimes you have to wait until the last race to win a regatta,” smiled tactician Jochen Schümann.